Our 18th Shokai Retreat was held between the 14th – 16th October 2016. The theme of this Shokai was Awakening to what has been done for me and a total of 14 participants joined the residents of Three Wheels for the retreat, including Mr and Mrs Ida our special guests from Shogyoji temple in Japan, and one new participant who selflessly threw himself into all of the activities. For the main part of our spiritual preparation for the Shokai we were each asked to think of three people, who at this very point in our lives, we feel especially grateful towards for what they have done for us. 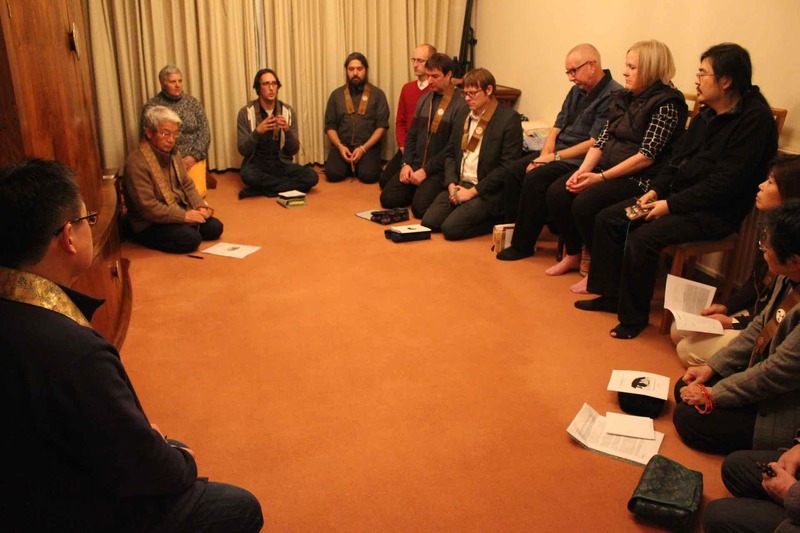 We then shared our expressions of gratitude with each other during a series of meetings during the Shokai. This gave rise to a wonderful atmosphere of joy and thankfulness which really brought the theme of the Shokai alive for all of us. 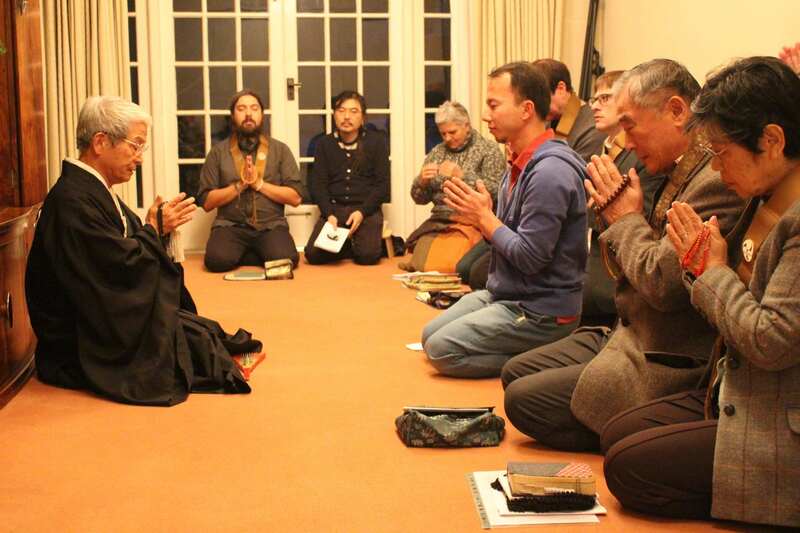 After the conclusion of the retreat we were able to share this atmosphere of gratitude with the participants of the Hooko Otorikoshi (Memorial for Shinran Shonin) London Eza meeting which followed immediately after the close of the retreat on Sunday afternoon. The Shokai retreat opened on Friday evening with the traditional ‘Vow of Sincere Practice’ given by Jumpei K in which he reflected on his recent spiritual encounters at Three Wheels which have changed the course of his life and a new found depth and appreciation he found towards his relationship to his father. His vow aptly brought the theme of the Shokai into sharp focus. Following Jumpei’s vow, Rev. 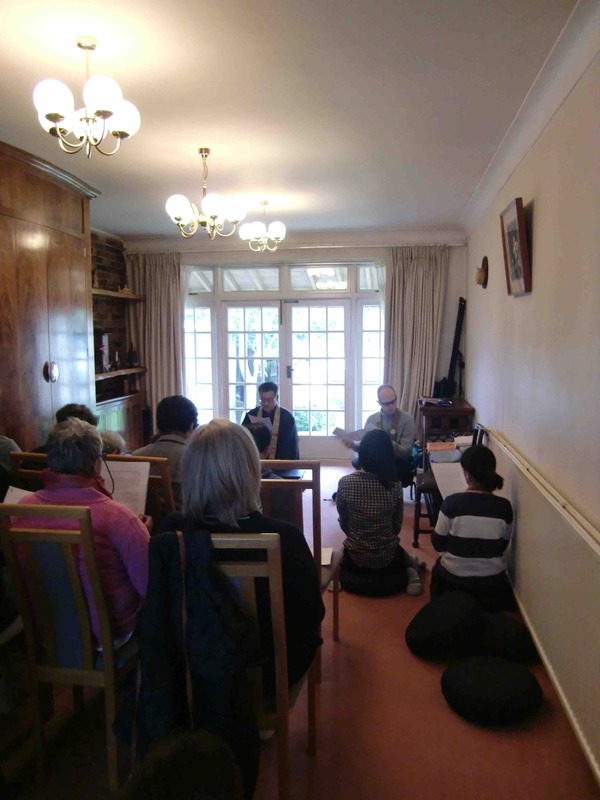 Sato welcomed everyone to this Shokai with a special Dharma-talk which touched on a number of important points related to the theme of awakening to what has been done for us. This included the meaning of ‘mindfulness’ (okunen) in Shin Buddhism. Mindfulness, Rev Sato explained, is a continuous, clear and transparent awareness of ki (the karmic reality of ourselves) and ho (the unconditional love of Amida Buddha) which saves us. This mindfulness is itself a gift from Amida Buddha to us. After our evening meal we all met in the Buddha-room and some of us shared our expressions of gratitude to three people in our lives. Mr and Mrs Ida both gave profound and moving recollections of their personal histories. They described their early lives in post war Japan and how they found the truth of life through their respective encounters with Shogyoji temple. Their experiences taught us so much about how everything in our course through life, even the most despairing of situations, gives to us an opportunity to entrust ourselves to Amida Buddha. Saturday was a full and busy day from the early morning work session (sagyo) starting at 6.30am to the final activity of writing our impressions of the retreat which concluded around 10pm. Following an extended morning Eza meeting in which more of us shared our expressions of gratitude to three people, Rev. Kenshin Ishii gave his own in the form of his Dharma-talk entitled Invaluable gifts to me from those who went back to the Pure Land. In this powerful and direct talk which one participant likened to a “transmission”, Rev. Ishii discussed the important teachings he had received from three late teachers of his, namely Rev. Kojun Shinohara, Rev, Eshu Seno and Dr. Kazuhiko Shimizu, that had such a deep and lasting impact on his life course. I found the essence of Rev. Ishii’s talk in the following words he gave, “What makes it possible to change our mind entirely is a true encounter with our own Good Teacher. This true encounter finishes our life, fully occupied by active karma, but also it gives us a new joyful life of Nembutsu”. It is deeply affecting to witness the still living influence of Rev. Ishii’s teachers on his life and we are so very fortunate at Three Wheels to receive the energy of their teachings from Rev. Ishii. Also on Saturday some much need tree pruning and garden maintenance work was done in the afternoon sagyo which was followed by a chanting lesson in which we practiced the liturgy to be used in the following day’s Hoonko Otorikoshi ceremony. Sunday morning was spent reflecting on what we had received during the retreat and we each shared our gratitude for all the time we spent together listening to the Buddha-Dharma and to one another during our shared journey of awakening to what has been done for me. Immediately after the closing service we had to suddenly switch gears and quickly complete all the remaining preparations for that afternoon’s London Eza.